Four moles of Cr2O2- are needed for the oxidation of six C atoms. In this special case, all of the carbon in the organic compound is assumed to be oxidized and the COD can be called TOD (total oxygen demand). Usually, the substrate is only partly oxidized by K2Cr2O7 and some organic oxidized products remain. These values of the COD may vary between 70% and 95% of the TOD. In order to reduce the 2 h needed for this measurement, several instruments have been developed and automated. In the on-line continuous COD measurement device made by the company Product Finder the standard method includes mixing the heated sample with K2Cr2O7 to drive a reduction of Cr(VI) to Cr(III). The green coloration is measured colorimetrically and is proportional to the amount of Cr(III) formed and the concentration of oxidized organic substance. Other oxidants are used by other developers. LAR takes advantage of OHo radicals which oxidize the organics at a high rate. These radicals are produced by an electrode, with a rate proportional to the electrical current and therefore the rate of oxidation. Other instruments use the fast oxidation of H2O2/UV with the measurement of H2O2 consumption (GIMAT), or O3 consumption with the measurement of O3 in water (PHOENIX-1010 STIP; Isco Inc.) or in air (OXI-JET; UVT-Ingenieurbüro für Umwelt- und Verfahrenstechnik). Organic substances contained in water samples are oxidized either (a) by UV rays (low-pressure UV lamp) in the water sample, (b) by wet chemical oxidizers in the water sample, or (c) by oxidizing at high temperatures (~950°C) with or without catalysts. The amount of CO2 can then be measured, either (a) by using a non-dispersive CO2 infrared analysis device, or (b) by using a flame ionization detector (FID) after conversion of CO2 into CH4 by heterogeneous catalysis. TOC (total organic carbon) measurement is usually performed on the sample after sedimentation. If the DOC (dissolved organic carbon) should be measured, the sample has to be separated from suspended non-settleable particles and from some colloids, by using a glass fiber filter or a centrifuge (Fresenius et al. 1988). Both filters and centrifuge glasses must be cleaned carefully with distilled water in advance. The TC (total carbon) is the sum of organic and inorganic carbon (CO2, HCO-, CO2- dissolved in water). Often both the organic and the inorganic carbon are measured after heating the sample to 950 °C (reaction tube 1, TC) and only the inorganic carbon at 150 °C (reaction tube 2, TC-TOC). The difference between TC and inorganic carbon is the TOC, if the sample was not filtered, and is equal to the DOC if the sample was filtered (Ramalko 1983). The measurement of TOC/DOC has been automated since and the time for analysis reduced remarkably. In the Shimadzu TOC-4110, the sample is oxidized catalytically after heating and CO2 is measured by low-pressure infrared analysis. Table 2.7 Total concentration parameters for typical raw domestic wastewater and after biological treatment with nitrification (Henze et al. 1995). a) WWTP Waßmannsdorf, near Berlin. The sample is diluted and prepared automatically, resulting in a low measuring time of 3-5 min. In two other developments, the combustion temperature is increased to 1150°C (TOC-/TC-Analyzer; GIMAT) or to more than 1200°C (Quick TOC; LAR) without using a catalyst. In all cases, calibration is necessary. Frequently, potassiumhydrogenphthalate is recommended (Fresenius et al. 1988). Table 2.7 presents some data for total concentration parameters in a typical domestic wastewater. • The BOD5 is lower than the BOD20 because of nitrification, which starts only after several days, and because of the removal of slowly biodegradable substances (see Section 2.3.1). • The COD depends strongly on the method used. A total oxidation and conversion to CO2, H2O, NO- is only possible by combustion at 900 °C and by using a catalyst or at ~ 1200 °C without any catalyst. German legislation concerning the discharge of wastewater into public sewers (Ind. VO 1989: Indirekteinleiterverordnung; regulation of indirect introduction) and into surface waters (Mindestanforderungen nach §7a, WHG (2002); minimum requirement, §7a, water resource policy law) places a limit on emissions. This will be presented shortly in the next section. After that we will briefly discuss EU guidelines for pollution control of waters, which limit immissions, that is, for discharges of treated wastewater into water, not concerning fixed loads or concentrations, but loads which can still be tolerated by the water. The most important piece of legislation is the "Indirekteinleiterverordnungen der Bundesländer der Bundesrepublik Deutschland (Ind. VO 1989)", regulation of indirect introduction by the states of the Federal Republic of Germany. All industries with discharges of contaminants into public sewer systems which exceed a minimum concentration or hourly load must report this to the local water authority. Effluents with high concentrations and loads coming from specific origins must be treated before being discharged into the public sewers. The Ind. VO of Baden Württemberg (regulation of indirect water disposal for Baden Württemberg, Germany) is presented as an example (Table 2.8). Table 2.8 Threshold values required for approval to discharge hazardous materials into public sewer systems (Ind. VO Baden Württemberg; WEKA 2005). a) Thresholds in g h 1 must be taken from water volume within 1 h.
• The settling rate of some solid particles with low density is not sufficient. • Toxic compounds may decrease the biological activity of bacteria. • High water temperature may cause an increase of total water temperature to >35 °C and the metabolism of bacteria may be slowed or stopped. • High, isolated loads of industrial discharges may cause too high a loading of the municipal plant, resulting in non-conformance to the regulations. In these cases, buffer tanks are often prescribed to protect the treatment processes of the municipal plant. Guidelines are given with ATV-A 115. These limiting emission values are valid for effluents from wastewater treatment plants and canals into bodies of water. Naturally, these canals collect treated wastewater from municipalities and industries, but other sources of wastewater may be additionally polluted by agriculture or small communities. Table 2.9 AbwV, Appendix 1: municipalities. Table 2.10 AbwV, Appendix 47: washing water for fuel gas from power plants. c) Loads given in g h-1 for 300 MW electric power. d) Discharge of this wastewater is not allowed. 2) Wasserfoaushaltsgesetz, water resource policy law. 3) Abwasserverordnung, regulation for wastewater. however, depend on the size of the municipalities (Appendix 1) and cover 56 industrial fields (Appendices 2-57). Here, we only want to present two examples: Appendix 1 (municipalities; Table 2.9) and Appendix 47 (washing water containing fuel gases from power plants; Table 2.10). All the necessary details concerning the collecting of samples, their preparation and analysis are given in AbwV. In contrast to municipal wastewater (Table 2.9), the effluents of fuel gas washing typically contain high concentrations of heavy metals. According to the regulation, these must now be separated from the washing water. Nutrients such as nitrogen and phosphorus as well as biodegradable substances (BOD5) contained in municipal wastewater are not considered as important pollutants here. Two types of values are to be distinguished: (a) I-values (which are obligatory = imperative) and (b) G-values (which are guide values = guidelines). A 1, simple physical methods. A 2, normal physical and chemical methods. A 3, advanced physical and chemical methods. • A better economical efficiency for all WWTPs; the degree of wastewater treatment is directly linked to the quality demands on the surface water generated, and unnecessary expenditures can be avoided. • The quality of the treated wastewater can be controlled in such a way to ensure that the surface water can be used as planned. • The total pollution of the surface water and its capacity of self-purification are considered. • Different qualities of treated water can be defined in order to stabilize the ecological equilibrium. • No experience has been gained with the sampling frequency and the allowed differences of high-tide values from the guideline values. • There may be problems if the discharged treated wastewater is to be controlled, because the receiving capacity depends greatly on the quality of the receiving water. AbwV 2004, Abwasserverordnung: Verordnung über Anforderungen an das Einleiten von Abwasser in Gewässer, Fassung vom 17.6.2004. ATV-A 115 1994, Einheiten von nicht häuslichem Abwasser in eine öffentliche Abwasseranlage, DWA Regelwerk 10. Bratby, J. 1980, Coagulation and Flocculation, Uplands Press, Croydon. Busse, H.J. 1975, Instrumentelle Bestimmung der organischen Stoffe in Wässern, Z. f. Wasser- und Abwasser-Forschung 8, 164-176. Chow, V.T. ; Eliassen, R.; Linsley, R.K. (eds) 1979, Wastewater Engineering: Treatment Disposal, Reuse, McGraw-Hill, New York. Cuno, M. 1996,: Kinetische Untersuchungen zum biologischen Abbau von Mineralölen und polycyclischen aromatischen Kohlenwasserstoffen, VDI-Forschungsberichte, Reihe 15, Umwelttechnik, 148. Dombrowski, T.; Lompe, D.; Wiesmann, U. 1989, Biologische Stickstoffeliminierung aus Abwässern, BioEngineering 5, 18-27. Fresenius, W.; Quentin, K.F. ; Schneider, W. (eds) 1988, Water Analysis, SpringerVerlag, Berlin. Henze, M.; Harremoes, P.; Jansen, J.; Arvin, E. 2002, Wastewater Treatment, Biological and Chemical Processes, Springer-Verlag, Heidelberg. Ind. VO 1989, Indirekteinleiter-Verordnung: Verordnung über die Genehmigungspflicht für die Einleitung gefährlicher Stoffe und Stoffgruppen in öffentliche Abwasseranlagen und ihre Überwachung vom 14. März 1989, Ind. VO ISBN. Lehr- und Handbuch der Abwassertechnik 1985, Organisch verschmutzte Abwässer der Lebensmittelindustrie, ed. Abwassertechnische Vereinigung e.V., St. Augustin, Ernst & Sohn Verlag, Berlin. Patterson, J.W. 1985, Industrial Wastewater Treatment Technology, Butterworths, New York, p. 273-302. Pöpel, F. (ed) 1997, Abwassertechnik und Gewässerschutz, C.F. Müller Verlag, Heidelberg. Pöppinghaus, K.; Fresenius, W.; Schneider, W. (eds) 1994, Chapter 2.2.1: Menge des kommunalen Schmutzwassers, in: Abwassertechnologie, Springer-Verlag, Berlin. Rahmen-Abwasser VwV 1992, Allgemeine Rahmen-Verwaltungsvorschrift über Mindestanforderungen an das Einleiten von Abwässer in Gewässer (RahmenAbwasser VwV vom 25.11.1992), Bundes-anzeiger 233b. Ramalko, R.S. 1983, Introduction to Wastewater Treatment Processes, Academic Press, New York (Table 2.1). Schuchardt, A. 2005, Bestimmung des dynamischen Sauerstoffeintrags in nitrifizie-rende Belebtschlammreaktoren einer kommunalen Kläranlage, VDI-Forschungs-berichte, Reihe 3, 842. Schulz, R.S. ; Becker, B. 2004, Deutsche Umweltschutz Gesetze, Bd. 5, Europäisches Umweltrecht, Verlag R. S. Schulz, Berlin. Walter, J. 1993, Vergleichende Untersuchungen zur Druckentspannungsflotation und Begasungsflotation von Emulsionen und Suspensionen in einem pH-Bereich von 6.8 bis 7.3, PhD Dissertation, TU Berlin. WEKA 2005, Das neue Wasserrecht für die betriebliche Praxis, WEKA Media. WHG 2002, Gesetz zur Ordnung des Wasserhaushalts (BGBl. I Nr. 59 vom 23.08.2002, S. 3245; 06.01.2004, S. 2), Wasserhaushaltsgesetz. The elementary composition of bacteria does not vary considerably during their life cycle and between different strains. Table 3.1 presents data for Escherichia coli (E. coli), left side (Bailey and Ollis 1977) and as mean values for bacteria, right side (Schlegel 1992). The various types of bacteria according to the eighth edition of Bergey's Manual of Determinative Bacteriology (1974) are categorized into 19 groups (Cano and Colomé 1986) or in 17 sections and seven groups (Volk and Wheeler 1986). Detailed information about the most important microorganisms was compiled by O'Leary (1989). The importance of microbial communities in environmental microbiology was the subject of the editors Insam and Rangger (1997). Schön (1978a, b) published an introduction for students. Table 3.1 Composition of bacteria (E. coli). a) Polymers recalculated to 100%. Fig. 3.1 Eubacteria (Schlegel 1992). Normally, bacteria are divided into ten classes. The first class is that of the eubac-teria, which is the most important in environmental microbiology (Schlegel 1992). Therefore, only eubacteria are characterized here in a general manner by Fig. 3.1. The size of bacteria in comparison to other particles is demonstrated by Fig. 3.2. Because of their small diameter of only 10-3 mm, bacteria have a large surface per mass. Since the uptake of nutrients occurs via the outer surface, bacteria are characterized by a high growth rate, resulting in a high substrate removal rate. 10"2 10"1 1 10 Fig. 3.2 Mean diameters of particles. As follows from Table 3.1, nearly 50% of bacterial cell mass is protein. Proteins are macromolecules formed by a chain of amino acids. Twenty different amino acids are used in nature for building proteins; and they are all characterized by the same groups, called peptides (Fig. 3.3). Fig. 3.3 Amino acids. (a) Structure of an amino acid. (b) L-type: isometric type of the simplest amino acid glycine. (c) D-type: isometric type of the simplest amino acid glycine. Table 3.2 Amino acids used for protein synthesis. D-type, which rotates it to the right (Fig. 3.3c). Only the L-type is used for protein synthesis; the D-type is used for antibody synthesis. The other 19 amino acids have asymmetric side-chains, each with a number of isomeric types. They are shown in Table 3.2. The chemical structures of all the 20 amino acids are published in several textbooks of microbiology, for example Cano and Colomé (1986) and Gaudy and Gaudy (1989). Amino acids polymerize by forming a polypeptide bond and releasing a water molecule, thereby building a protein molecule (Fig. 3.4). The 20 amino acids can be combined to many permutations in this way to form large protein molecules with a molar mass up to 106 g mol-1 and an enormous number of different successions of amino acids. The four atoms of the peptide bond are oriented in one plane, in contrast to all other atoms which lie in different planes. The primary structure of the protein molecule results from a linear polymerization. R1, R2, ... R20 are the different side-chains which are typical for one of the 20 different amino acids. Because of the high number of possible structures and varying molar mass, proteins are able to assume different functions. Some of these are described in Table 3.3. Enzymes are biocatalytic proteins. Nearly all reaction steps in living organisms are catalyzed by enzymes. No organism would be able to live without the effect of enzymes; and each reaction step must be catalyzed by a special enzyme. Therefore, enzymes and their functions will be discussed briefly. Table 3.3 Different groups of proteins and examples for special functions. where k is the coefficient of reaction rate, ko is the theoretical maximal value for T^ro (°C), Ea is the energy of activation (kJ mol-1), R is the general gas constant (kJ mol-1 K-1) and T is the temperature (K). A reduction in eA leads to an increase in k. The significance of enzymes is their ability to reduce eA considerably, which results in high reaction rates at moderate temperatures (Fig. 3.5). The free energy change of a reaction can be measured as the heat of reaction, resulting in a transfer of energy to the surroundings. The simplest reaction may be the isomerization of a substrate molecule. 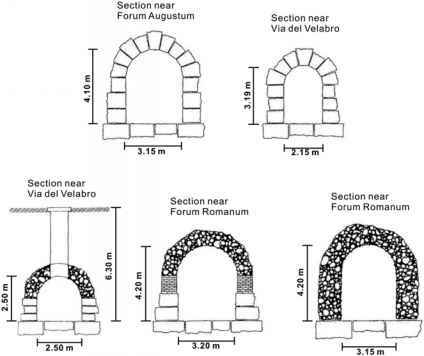 This can be described in a very simple way by Fig. 3.6a (Scragg 1988). Fig. 3.5 Reduction of energy of activation by an enzyme (catalyst). Fig. 3.6 Models for a better understanding for the effects of enzymes. (a) Model for a one enzyme-one substrate reaction without transfer of atoms or molecules (isomerization). (b) Model for a one enzyme-two substrate reaction with the help of a prosthetic group. Eq. (3.6) can be transformed easily to linear equations, which are suitable for testing experimental results and for determining rs max and Km (plots called Lineweav-er-Burk, Langmuir and Eadie-Hofstee; see Scragg 1988). A further large group of enzymes called oxidoreductases catalyzes oxidation and reduction reactions (redox reactions) by the transfer of H+ ions from one molecule to another. 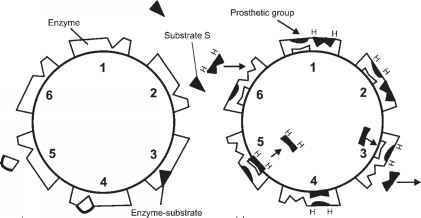 Enzymes with a prosthetic group are able to take up two different substrate molecules at two different active sites. The transfer of H+ progresses via adsorption at the prosthetic group, which does not leave the substrate (Fig. 3.6b). 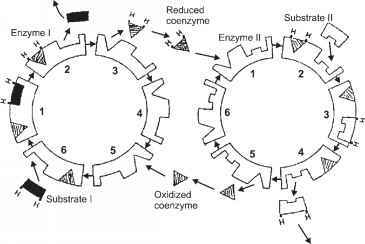 A further system consists of a pair of two different enzymes, each of them for one of two different substrates. Let us discuss this kind of biocatalysis again for the case of a redox reaction. Now the H+ ions must be transferred from one substrate molecule to the other. For this purpose, a coenzyme is needed as a small part of the substrate molecule which is able to oxidize substrate 1, to leave substrate 1 and to carry the H+ ions to substrate 2, where substrate 2 is then reduced (Fig. 3.7). Fig. 3.7 Model for a two enzyme-two substrate reaction with the help of a coenzyme (e.g. 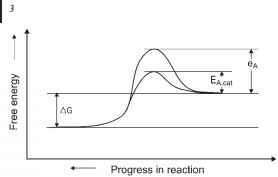 redox reaction). The most important enzymes can be divided into six large groups, which are listed in Table 3.4. Although a very large amount of information can be stored and transferred by proteins according to their primary structure, proteins exhibit further distinctions forming secondary, tertiary and quaternary structures. Detailed information is given by Cano and Colomé (1986). Table 3.4 Important groups of enzymes. A nucleic acid is formed from a large number of nucleotides via polymerization. Each nucleotide consists of a heterocyclic nitrogen base, a pentose sugar and a phosphate group (Fig. 3.8a). Besides adenine as the nitrogen base in Fig. 3.8a, three other bases can be connected to carbon atom 1' of the pentose molecule. Figure 3.8b shows the four nitrogen bases. One nucleotide is connected with the next by coupling the marked OH bond (see Fig. 3.9) with the OH bond 3' on the pentose sugar and releasing H2O. Each coupled nucleotide is characterized by one of the four heterocyclic nitrogen bases in Fig. 3.8b. In this way, a polynucleotide is formed. Now, a second nucleotide is constructed parallel to the first in the same manner with the opposite base. 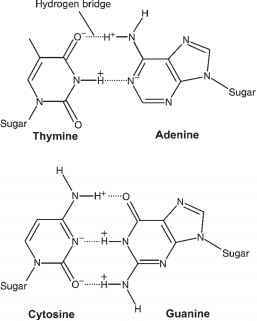 Cytosine forms a hydrogen bridge with the guanine on the other side and adenine forms the same bond with thymine, its opposite. Both nucleotides spin around each other in such a way that a helix is formed (Fig. 3.9). This helix is turned a second time round the same axis, but with a longer period, forming a double helix (Watson and Crick 1953; Sayre 1992; Wilson 1988). Figure 3.10 shows the hydrogen bridge in more detail. Thymine and adenine are coupled by two bonds and guanine and cytosine by three bonds, two between O-and H+ and one between N- and H+. Fig. 3.8 (a) A nucleotide with adenine as one of four different heterocyclic bases. (b) The four heterocyclic nitrogen bases for four different nucleotides forming DNA. Fig. 3.9 Two polynucleotides coupled by hydrogen bridges forming a DNA molecule in the form of a double helix (Cano and Colomé 1986). and the opposite side of the DNA the anticodon. Several acids are coded by two different codes (Table 3.5). Three different codes are used for the order "stop" or "termination site". The reading of the building plan for each protein starts and ends with this code. Fig. 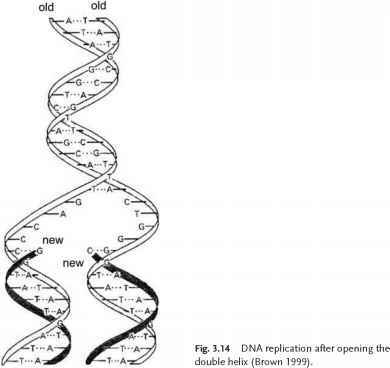 3.10 Hydrogen bridges between both base pairs of DNA (Brown 1999). Table 3.5 The genetic code of amino acids (Brown 1999), written for DNA (instead of RNA). • Uracil is used instead of the nitrogen base thymine (Fig. 3.11). • An RNA molecule consists only of one molecule chain and not two as in DNA. • RNA molecules are much shorter than DNA molecules. Fig. 3.11 Primary structure of RNA (Cano and Colomé 1986), showing structure of uracil, a nitrogen base in RNA molecules. mRNA arises during the reading of the building plan for a protein which is coded on a section of the DNA, beginning at a triplet coding the promoter side (start) and ending with the termination side (stop; Fig. 3.12a). An enzyme (RNA polymerase) opens both parts of the DNA by cleaving the hydrogen bridges (Fig. 3.12b). Nucleotide molecules diffuse to the complementary nucleotides of the DNA and are coupled together by hydrolysis and reactions at C atoms 3' and 5' of the pentose molecule. The enzyme wanders along the gene, the hydrogen bridges are closed again and the mRNA grows until the termination side is reached (Fig. 3.12c). Fig. 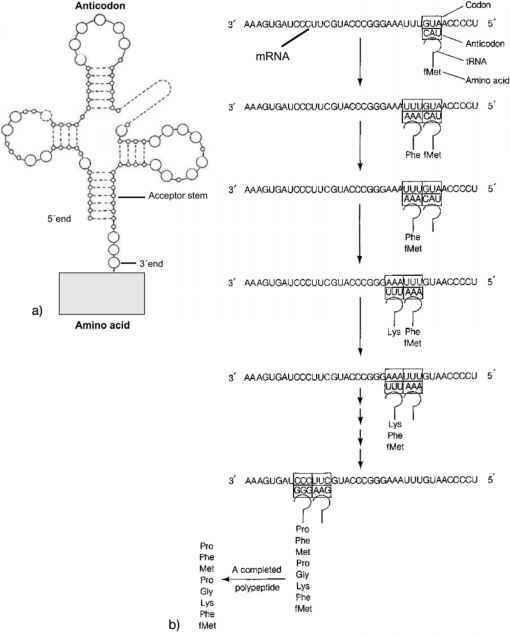 3.12 Transcription steps (a-c), forming an mRNA molecule (Cano and Colome 1986). Fig. 3.13 (a) tRNA with anticodon and the typical end for coupling amino acids. 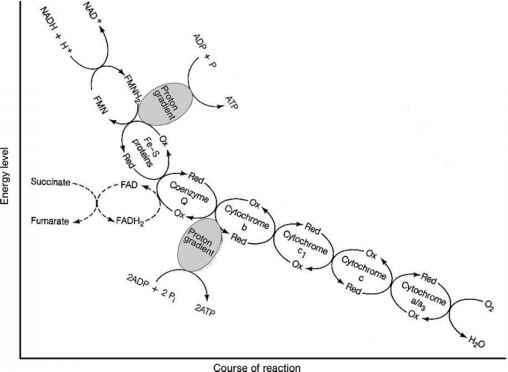 (b) Protein synthesis by reading of mRNA (Cano and Colome 1985). to the first to obtain its amino acid. In this way, a protein molecule is made which was coded at the section of the DNA being read. The mRNA is used repeatedly for the production of the same protein every time, but after some time it degrades and a new mRNA must be produced. 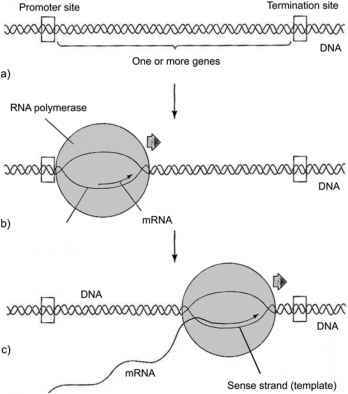 In a similar way, the mRNA is decoded by the rRNA and the according polypeptide grows inside the ribosomes. In ribosomes, the proteins are manufactured. They exist in the cytoplasm. Ribosomal proteins are assembled together with rRNA before being transported through the nuclear membrane. rRNA makes up the vast majority of RNA found in a typical cell. The reading of the mRNA and protein synthesis by tRNA and rRNA are called transmission. During each cell division, a complete copy of the total DNA must be produced, so that both daughter cells obtain the same genes as the mother cell. This process is called DNA replication. Very high precision must be guaranteed. Even one mistake in 104 nucleotides may cause changes with serious consequences (Brown 1999). (not shown), is the first step. 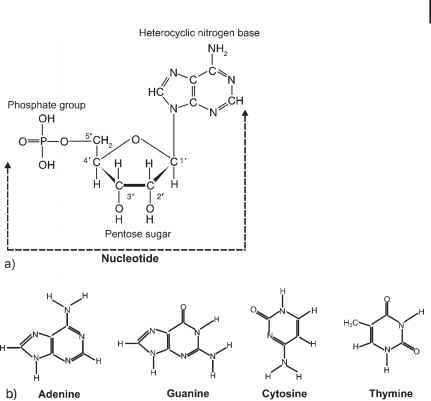 After that, the nucleotides already synthesized inside the cell are coupled by hydrogen bridges to the complementary base of the mother DNA (thymine and adenine, guanine and cytosine). The last step is the coupling of the two pentose groups (bond 3' with 5') via the phosphate group, thereby splitting off one H2O molecule (Fig. 3.14). During the division of a bacterial cell, each of the two DNA molecules will be housed in one of the new cells. Normally DNA replication occurs without any errors. But, considering the enormous number of cells, e.g. such as bacteria, the short time between two consecutive replications and the length of the DNA, with thousands of genes, errors do occur during replication. These are called mutations. A mutation is a change in the nucleotide sequence of the DNA during the process of replication. In all these cases, one of the two daughter cells has DNA which is not the same as the mother DNA and it may exhibit some new properties. The rate of mutations can be influenced by chemical reactions between special compounds and DNA. Further, the rate of these reactions is influenced by pH, temperature, concentration and other physical parameters, such as the intensity of UV radiation. These mutations make it possible for microorganisms to degrade new organic substances produced synthetically in the chemical industry (chlorinated benzenes and phenols, dyes, etc. ), which never occurred in nature before. All the processes of synthesis described above need energy, which is provided by catabolic reactions. During these catabolic reactions, chemical energy is stored by forming ATP from a compound with lower energy, ADP; and it is then used partly as chemical energy and is partly converted into thermal energy, resulting in an increase in temperature. The structures of ADP and ATP are given in Fig. 3.15. According to that chemical balance, the same energy is available at a later time when enzyme B is engaged. There are three mechanisms for the coupling and decoupling of a phosphoric acid group (phosphorylation). 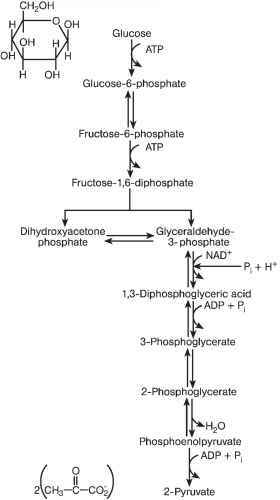 The most important for the catabolic pathways discussed later is called substrate-level phosphorylation. Fig. 3.15 Adenosinediphosphate (ADP) and Adenosinetriphosphate (ATP). Fig. 3.16 (a) Equilibrium between NAD+and NADH + H+ (Cano and Colomé 1986, modified). 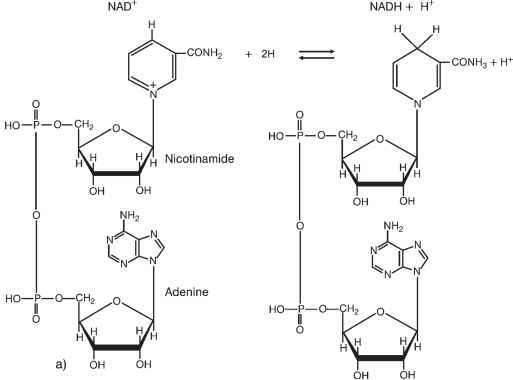 form NAD+ and in the reduced form NADH + H+ (NADH2); and Fig. 3.16b shows the coenzyme FAD. Positively charged NAD+ loses its charge during reduction and is combined with a proton (NADH + H+). This is only possible by reorientation of the double bonds and reduction of the five-valent nitrogen atom of the nicotine amide group to a three-valent one. The FAD molecule is constructed similarly (Fig. 3.16b). The NADH2 coenzyme diffuses to the same enzyme (see Fig. 3.6a) or to another enzyme (see Fig. 3.6b), where another substrate is to be reduced. The importance of NAD and FAD will be discussed in the following catabolic degradation of glucose. Fig. 3.16 (b) Structure of FAD (Scragg 1988). During the first part of glycolysis (Fig. 3.17) two ATPs must be reduced to two ADPs. 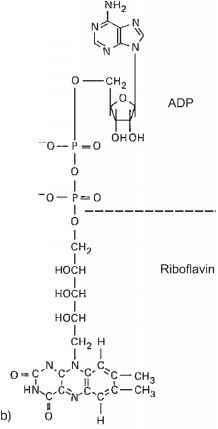 From one glucose molecule (6 C), two molecules of glycerine aldehydes-phosphate (3 C) are produced. 2\ch3~c~co y Fig. 3.17 Glycolysis (Cano and Colomé 1986). Fig. 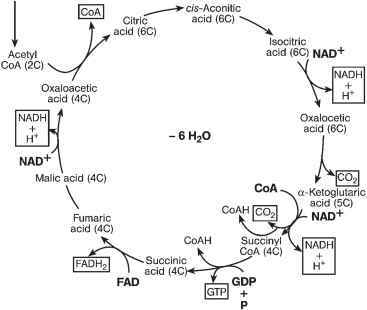 3.18 Citric acid cycle (Cano and Colomé 1986). Note that: 2 ADP + 2 H3PO4 ^ 2 ATP + 2 H2O and FAD+ + 2H ^ FADH + H+ (FADH + H+ = FADH2). Altogether, 10 NADH 2 + 2 FADH2 are now oxidized, passing now eight links of the respiration chain or electron transport system. Figure 3.19 presents a qualitative plot of the energy level versus the course of the reaction. If NADH2 is oxidized, the hydrogen atom is transported from the first link to the last and oxidized by O2 to H2O. Fig. 3.19 Electron transport system of respiration chain (Cano and Colomé 1986). Remember that: 34 ADP + 34 H3PO4 ^ 34 ATP + 34 H2O. 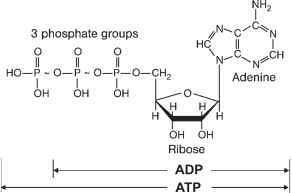 Alltogether, 2 ATP (Glycolysis) + 2 ATP (Citric acid cycle) + 34 ATP = 38 ATP are produced. The rest, or nearly 60%, is converted into thermal energy. If we simply replace oxygen with inorganic electron acceptors (NO-, NO-, SO42-) or with hydrogen, catabolism is nearly the same as in the aerobic case, with the exception of the respiration chain. Therefore, a lower amount of ATP is produced. Environmental scientists call this anoxic metabolism. We will come back to this topic, when we discuss denitrification in Chapter 10. Bacteria which produce lactic acid (e.g. Lactobacillus bulgaricus) are of great importance for the food industry. Because of their relative insensitivity with regard to low pH, they are used for food sterilization (yoghurt, sauerkraut, pickling, etc.). As the bacteria produce more and more lactic acid and the concentration rises, the pH falls and increasing numbers of bacteria are killed off, until even the lactobacilli themselves die. L. bulgaricus, for example, is used to produce buttermilk. The greatest part of the chemical energy of 1 mol glucose remains in 2 mol lactic acid, resulting in only 2 mol ATP and a small increase in biomass. Because fermentation to ethanol is inhibited by the end-product, only about 18vol% ethanol is attainable (wine, beer, etc.). For more highly concentrated alcoholic drinks, water must be removed by distillation and condensation or by reverse osmosis. Ethanol can also be produced from liquid wastes, which are predominately polluted with mono-, di- and polysaccharides, or renewable raw materials, and then used as a fuel additive to gasoline. In anaerobic wastewater treatment processes, acetic acid is produced by the fermentation of higher fatty acids. This is discussed in more detail in Chapter 8.